The presidential candidate of the Peoples Democratic Party (PDP), Atiku Abubakar, says his endorsement by the Ohanaeze Ndigbo, Afenifere, Northern Elders Forum, Pan-Niger Delta Forum and Middle Belt Forum, shows there is hope for Nigeria. In a statement he personally signed on Sunday, the PDP candidate said the fact that the leaders had decided to set aside their differences and unite to support his candidature, was a loud statement and a decision he said moved him to tears. “I am moved to tears that in the midst of deep divisions and deliberate use of instrumentalities of state to set our people against themselves in the last three and a half years, responsible and respected leaders across Nigeria have agreed to come together for the purpose of endorsing my candidature for the February 16th, 2019 presidential elections,” he said. 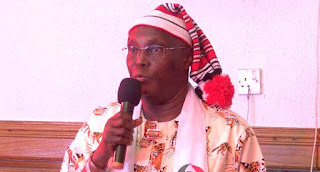 Atiku, therefore, promised to unite every region and zone of the country if elected President. Atiku’s comments come few hours after leaders of the various groups backed his candidature less than two weeks to the presidential election. The leaders declared their support for the PDP candidate on Sunday at a meeting tagged: Summit of Nigerian Leaders and Elders. While explaining the reason for their decision, they accused President Muhammadu Buhari of dividing the country and not having control of the presidency.